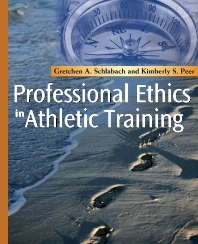 An invaluable resource for any athletic training curriculum, this text introduces athletic training as a profession by presenting an ethical framework of values, principles, and theory. Chapters explore important issues related to cultural competence, foundational behaviors of professional practice, professional and moral behavior, and ethical decision-making - skills that both inform and transcend the athletic training profession. Learning activities at the end of each section help you see connections between the material and clinical practice, revealing new insights about yourself, your profession, and the organizations with which you will interact. Content draws connections between ethical values, principles, and theory, as relating to the Foundational Behaviors of Professional Practice. Over 100 case studies promote critical thinking with clinical examples of ethical situations and conflicts that correspond to the domains identified by the Board of Certification (BOC) Role Delineation Study. Learning Activities chapters at the end of each section provide over 60 activities designed to link content and theory to clinical practice. Organized into three levels, Level One consists of an introduction to professional ethics in athletic training, Level Two focuses on professional enculturation, and Level Three explores the application of ethical concepts in professional life. Good to Know boxes highlight information throughout the chapters to enrich content and identify applications in the field. Professional Pearl boxes contain quotes from NATA Hall of Fame Inductees, offering advice about the challenges often faced in the profession. Chapter outlines, learning objectives, and ethical concepts at the beginning of each chapter lay out the information in an easy-to-follow framework. Appendices include self-assessment and evaluation tools that encourage you to assess where your own responses fall within ethical boundaries. Sections on cultural competence and ethical dilemmas increase awareness of diversity by exploring scenarios in which the practitioner's and patient's morals may conflict.